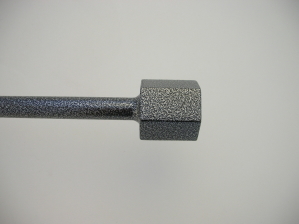 All poles are made to your exact measurements. 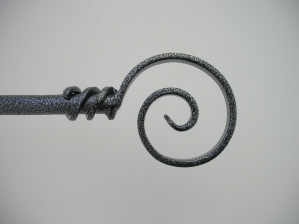 They are superb quality 20mm solid wrought iron and come complete with finials, vertical brackets (including centre bracket on the poles over 183cms), screws, rawlplugs and iron rings (4 per 30cm of pole). 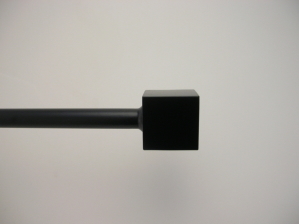 Poles over 304cms will be supplied in two pieces with a centre joining bracket. 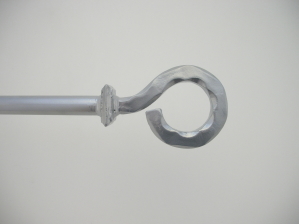 We can also supply horizontal and ceiling brackets for an additional charge. 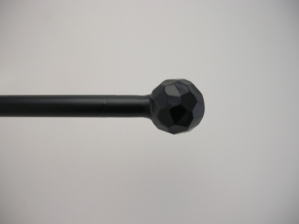 We also make 16mm . 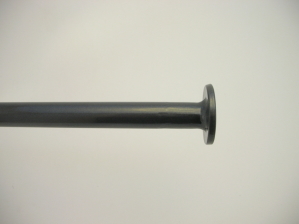 Please click here for prices and ordering details for 16mm diameter poles. Carriage is £15.00 per order (UK MAINLAND ONLY). Email for overseas carriage paid prices please. 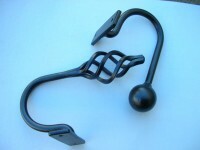 They are delivered by xdp.co.uk within 14 working days of order. 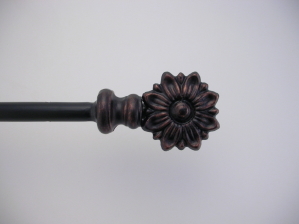 Scroll down for finial styles and prices. 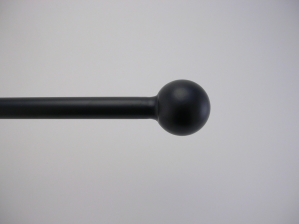 Please note that these 20mm poles are available in our full colour range and not just as per sample finial colours shown in finial pictures below. 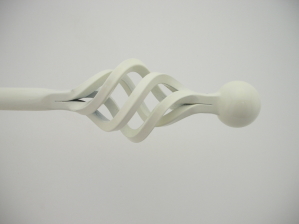 We can make poles over 427cm, please ring 01745813245 to order. On-line ordering is simple and secure . 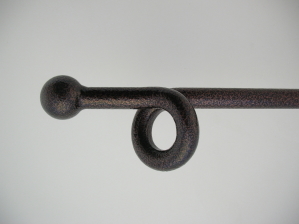 Select your curtain pole from the drop-down list below, then select the finial and colour finish required from the drop down boxes and press submit. 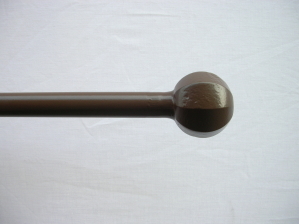 All our curtain poles are made to measure. If the length of the pole you require is not in the drop down list you can purchase the next size up and state in the message box what length you require. (the message box will appear when you click the "add to cart"button. 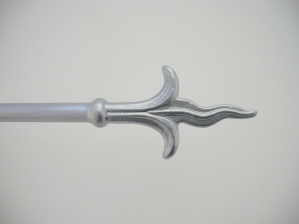 To order give the overall length ( i.e including the finials). To find the overall length measure inside width of window and add enough room for your curtains to be drawn back plus room for the finials. 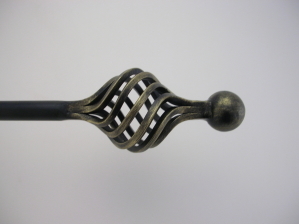 The length of the finials is shown in the pictures above. 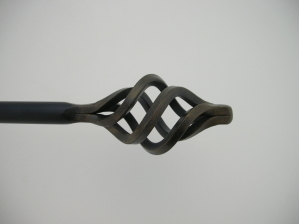 Shepherds Crook, Scroll End, Knott End. 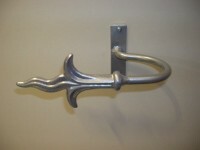 All other finials are available in 20mm. NOTE: You are able to choose the quantity of horizontal or ceiling brackets after you have pressed the ADD TO CART button. IF you do change the quantity of any item then you MUST press the recalculate button . Where holdbacks only are bought there will be an additional carriage charge of £8.70 charged to your card. 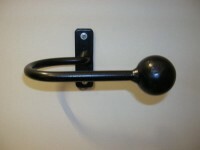 Our standard brackets have a 8cm vertical back plate with two screws. They come out 5cm at the top and then drop into a U shape. 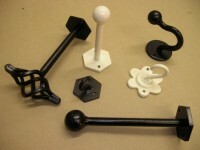 However we can make brackets to your specific requirements. 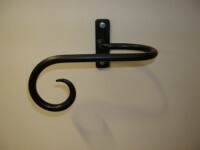 For limited space we also do horizontal brackets with back plates 2.5cm wide. 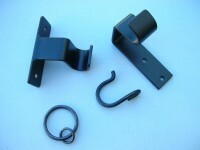 We also supply ceiling brackets. Please telephone order hotline to order or for more information. 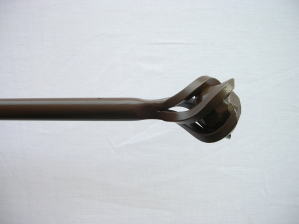 Straight poles over 304cms are supplied in two halves with a centre joining bracket. 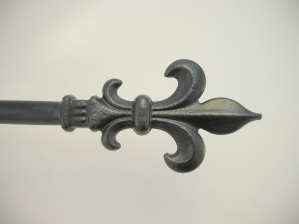 To order: Give the overall length ( i.e including the finials).